We are currently facing a Wal-Mart Super Center invasion in our town. At first, I thought it would be nice to have a Wal-Mart near by--nearer than the three other Wal-Marts which are each 20 minutes away. But after listening to this book, I changed my mind. Even if you're not a mathematician, the author presents the data in perfectly, logical and understandable ways. The real-world examples of how company's benefit ("Makin' Bacon") and suffer (Huffy bicycles) because of Wal-Mart is eye-opening. Both the examples and numbers are staggering! And they're non-stop! The comprehensive facts and figures in this book will leave you with your jaw on the floor. For instance, Wal-Mart sells more goods by St. Patrick's Day than Target, its nearest competitor, will sell all year! Like a previous reviewer states, this book is a very balanced presentation. However, what seemed obvious to me is that the good that Wal-Mart apparently does, eventually leads to bad things. The way Wal-Mart permeates everything in the world...no that's not an overstatement...it makes Ma Bell pale in comparison. Why Wal-Mart isn't investigated as a monopoly is beyond me...just my opinion. I cannot praise Charles Fishman enough. Listening to this book took more than 9 hours...it felt like 9 minutes. Everyone should get a copy of the "Wal-Mart Effect", whether you shop at Wal-Mart or not. Think of this book as the cheapest class you can take to become a truly informed consumer. Learn all about how the retail industry operates...or rather how Wal-Mart forces the retail industry to operate. 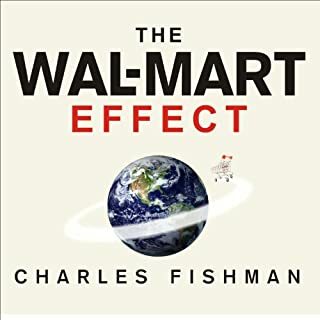 Long and short of it is, for or against Wal-Mart, if you listen to this book, you will NEVER look at Wal-Mart the same way again.